These Italian bow tie cookie recipes are family favorites to enjoy. Bow tie cookies are also known as guanti or wandi (gloves) and are sometimes called angel wings. 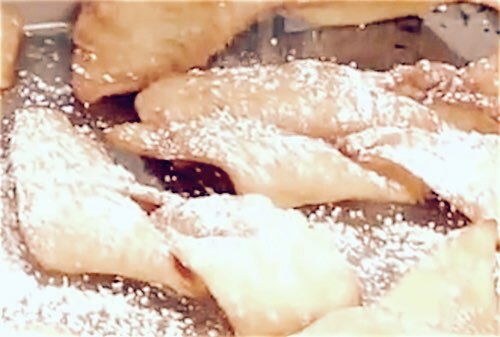 Deep fried and sprinkled with powdered sugar, what's not to love about these Italian cookies? Made plain or dressed up with colored candy sprinkles, they are suitable for serving on any occasion. I located an old fashioned recipe for the Italian fried cookies that are tied into knots. However, in my old cookbooks they are called Bow Cookies. 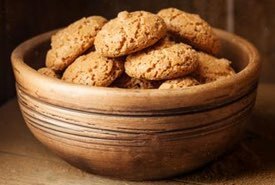 I grew up in a Connecticut town with many Italian-American families and loved the huge platters of cookies made for all the major holidays! 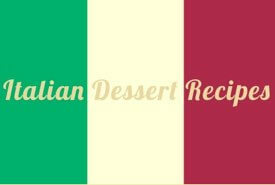 In a large bowl, mix the eggs, sugar, salt, vanilla, and flour until well blended. Taking a small part of the dough at a time, roll it out very thin and cut into strips about 1-1/2 inches by 6 inches. Make a slit on one end and pull the other end of the dough through the slit. Fry in oil until golden brown, then remove and drain on paper towels. Sprinkle with confectioners sugar or drizzle with honey and grated orange zest. This Italian bow tie cookie recipe makes about 4 dozen cookies. I grew up on the south side of Des Moines, Iowa. 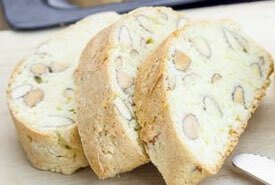 There was an Italian lady (Rose) who made these Italian Festival Cookies every Christmas, and her recipe was published in the Des Moines Register & Tribune on Nov. 12, 1953. I've kept it all these years. The name "guanti" is Italian for gloves. The dough is supposed to stretch out in "fingers" as it fries and that's the reason for the name. However, these cookies can also be made into bows. Beat eggs until light and add remaining ingredients in order given. You may need a little more or less flour, depending on the brand. Dough should be medium soft. Knead well and let stand about 2 minutes; then knead 3-4 minutes longer. Work with a little dough at a time — about the size of a baseball. Keep bowl of dough covered because you want it to stay moist. Roll dough very thin, like tissue paper if you can manage it. You can cut dough with a cookie cutter of any size or shape. She preferred to cut it in long strips, then form into rosettes, or tie in bow knots. The more jagged edges on the dough, the fluffier, and the prettier the cookie. Slash edges with knife or scissors. Fry in deep fat until delicately browned. When cool, dribble thinly powdered sugar icing over the cookies and sprinkle with tiny colored candies if you like, or you can drizzle honey over the cookies and sprinkle with chopped nuts. For this Italian bow tie cookie recipe, roll dough approximately 1/8 inch thick. Cut in strips approximately 1 x 2 inches, cut slit in middle and loop one end through slit. Deep fry until golden brown. Drain on brown paper bags. Sprinkle with Confectioner's sugar when ready to serve.